NARS Radiant Creamy Concealer... I have this in Cafe covers acne and dark spots perfectly. During the summer months, I have used it without foundation for low coverage days or when I am running late to work. The coverage it amazing and does not clog your pores. Don't believe me then check out THE reviews. Then, there is the Caudalie Divine Oil, it is the perfect to tame the skin after being in the sun and even better as a substitute for body lotion. Leaves absolutely no greasiness, and the smell does not overpower ....The travel size is most convenient to carry daily in my purse. Another beauty item is the Revlon brow fantasy pencil/gel, I just recently got my hands on this and it is a good start if you want to experiment with thick eyebrows. The gel does not create a mess. The only downside to this is that it requires the not provided pencil sharpener. If you are ok with buying pencil sharpeners then go for it. For everyday multi-use products, my favorite, Moleskine Notebooks because of all the notes we take all day. 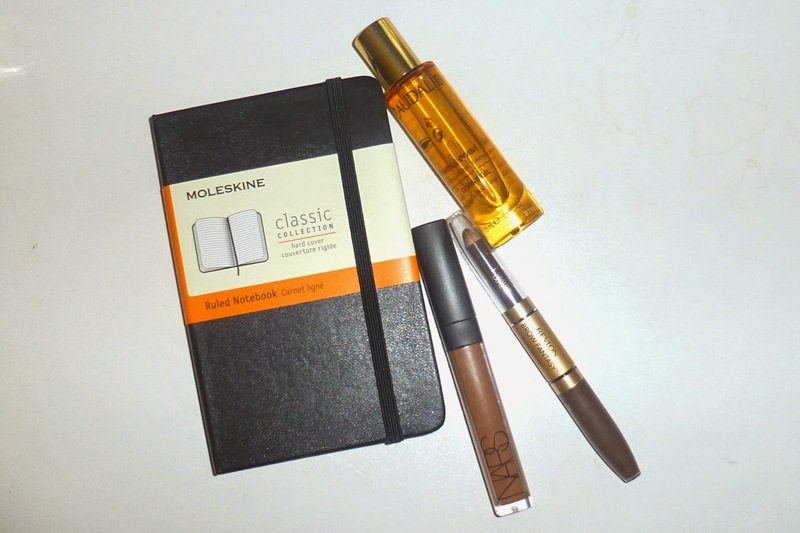 When it comes to notebooks, a Moleskine is the way to go! The binding is strong and they come in every color you could ever want. A color for all the moods we have? Also perfect little gift for someone going back to school. Ball Mason Jars are one of the things I have been obsessing about all summer, you can use it for just about everything. Like everything. I use the Large for daily water intake at work, medium size for morning iced coffee and the small one to hold anything from candy to spices!